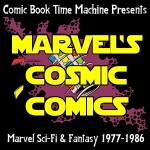 To celebrate 100 episodes of both the Marvel’s Cosmic Comics sub-feed AND the main feed, we cover John Carter’s 2nd annual AND John Carter’s big screen appearance! First, The Headmen of Mars, a fantastic story of horror and weirdness! Then, my review of John Carter, the movie, from a 2012 episode of one of my other podcasts, Strangers and Aliens!